Murphy arrived in June of 2015 from the New Holland auction in PA. This 8 year old mini donkey came as a ‘Jack’ (or ungelded male donkey) and had been used for breeding purposes before ending up at auction. We are always happy to be able to bring home minis and donkeys to geld, as they will then no longer be breeding potentially unwanted babies in the future. Murphy arrived with many rub marks and patches of hair loss across his body, has certainly benefited from lots of TLC. Murphy has had a great time here on the farm, and has come a long way in his trust of people. He has blossomed into a sweet and sensitive little guy, and he now stands quietly for grooming and the farrier. Murphy spends his days with J.J. or Mikey while awaiting his own forever home. He would do best in a home where he could receive lots of one on one attention to build confidence since he is a slightly shy and cautious little guy. He is great for the veterinarian and will stand for the farrier. We are also introducing Murphy to driving. He long lines and is now pulling weight with his harness. UPDATE: We are pleased to announce that after almost a year of searching, Murphy has found his forever home. That’s right; Murphy has been adopted. This quiet and shy mini donkey came to us as a former breeding stud that was discarded at the New Holland Auction. Horses with Hope rescued him, along with his pal Taffy and brought them home in June 2015. After we gelded him, we started the process of gaining his trust and healing the physical and emotional scars that he had. Murphy really came a long way. Murphy went from being withdrawn and reserve to tackling any task that was placed in front of him, sometimes with a little guidance. He learned to long line and drive but enjoyed his walks around the property the most. This little donkey generated more interest than most of our rescues combined. However, it was the Eaton’s who scooped this fellow up. Lori has a thoroughbred named Norman who is blind in one eye, and who needed a companion. We were not sure if Norman had ever seen a donkey before and were not sure what he would think. Well it was love at first sight. Norman was crazy about Murphy and Murphy settled into his new home rather quickly. Lori says, “ Norman loves him. 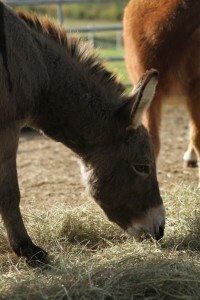 They love to share hay and are getting along wonderfully.” She even referred to Murphy as an “outstanding creature”. We couldn’t agree more! Congratulations to the Eatons and Murphy! We couldn’t be happier!